The family of Misima Yukio decided to make a deal with Yamanakako village in his manuscripts and materials, amounting to 1,000,000 words at 300,000,000 yens (about three million dollars). Yamanakako village is a declining resort upon the Lake Yamanakako, one of Huzigoko (five lakes around the Mt. Huzi). The village government has a plan of Yamanakako Bungaku no Mori (the Lake Yamanakako Library Grove) for sight-seeing, featuring the Misima Yukio Literary Museum, design of which is to take after Misima's own gorgeous residence in colonial style at Magome, Tokyo, nevertheless there are not any relation between the Misimas and the village. The village government will make them public in 1997. On April 14, Asahi Sinbun, a Japanese big newspaper, reported that one third of them was completely unknown ones and that discovery of the forward of Kamen no Kokuhaku (Confession of a Mask) and notes for Hozyo no Umi would be literary event. It is, however, a false report. Because the forward of Kamen no Kokuhaku is well known among scholars and it has already appeared on Misima Yukio (in Sintyo Literary Album series). Notes for Hozyo no Umi are also well known, some of which appeared serially in Nami magazine in 1970. Though these manuscripts contain unpublished works, Misima and his late widow did not regard them worth of his fame, and editors of Complete Works of Misima Yukio know it. The Donald Keen Center of Japanese Culture held a month-long cultural appreciation of Abe Kobo as its tenth anniversary, in April 1996. Abe's photographs, death mask, personal items, manuscripts and first editions of his works were on display in the C.V.Starr East Asian Library in Kent Hall April 8 - May 31. Sintyosya, a Japanese traditional publisher, releases Selected Works of Oe Kenzaburo in 10 volumes on May 29. Each volume contains about 200,000 words in 510 pages, featuring a few novels and short stories. You can order it to online-bookshops. Uno Tiyo, female novelist, died on June 10 at age of 98. A lot of young female readers attended at her funeral ceremony. Maruya Saiiti, Takamatu Yuzi and Hikawa Rezi published a new complete translation of Ulysses from Syuesya on June 16 (Bloom's Day) 1996. 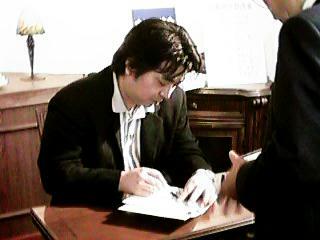 Maruya is one of the greatest critic in Japan and also known as novelist. Hikawa and Takamatu are scholars of English modern literature. They translated Ulysses in 1964 too, which was the third full translation of it in Japan, and won the praise of "the first readable Joyce in Japan". Their new translation contains a lot of footnotes based on recent achievement of Joyce study. At Sibuya, Tokyo, an old house is going to be pull down, where Misima Yukio lived from 12 to 25 years old. In this house, he published his first story, Hanazakari no Mori (Woods in full blossom), made a decision to resign the Ministry of Finance for literature and wrote his most important novel, Kamen no Kokuhaku (Confession of a Mask). The owner has an intention of donating the house for reservation and he consulted with Mr. Inose Naoki, author of Perusona -- Misima Yukio den (Persona -- a biography of Misima Yukio. in 1995), which is the iconoclastic study against Misima legends and presents his new images, diligent and petit-bourgeois like ones. Mr. Inose sounded out the Yamanakako village government as to reservation of this old house, because it is building the Misima Yukio Literary Museum, design of which is to take after Misima's last gorgeous residence in colonial style. The village government, however, refused the donation of owner. Mr. Inose pointed out commercialism of Yamanakako village and deplored the village chief, who is boasting that he has never read works of Misima at his column in Syukan Bunsyun magazine. Mrs. Wasima Seki died on June 23 1996 in Tokyo at age of 94. She was a film actress and is known as model of Naomi, heroin of Tanizaki Zyun'itiro's Tizin no Ai (Naomi, 1925). She was born at Maebasi, Totigi prefecture in 1902. When she was 13 years old, her elder sister, Tiyo, got married to Tanizaki Zyun'itiro. Seki was so beautiful girl with American-like features that Tanizaki loved and worshipped her. He admired especially her leg-lines, which awoke him to leg-fetishism. When she was 15 years old, Tanizaki dared to live together with her, separating with his wife. He proposed marriage to Seki but she refused him, making many love affairs. She became a film actress with his assistance and he gave her screen name, Hayama Michiko. Inspired by her, Tanizaki wrote two novels, Nikukai (A Lump of Flesh, 1923) and Naomi. A Lump of Flesh is a poor work but Naomi is a masterpiece, presenting new type of Japanese woman against conventional feminine images, chaste, moderate and obedient to males. Tiyo, her sister, divorced with Tanizaki and got married with his best friend Sato Haruo, one of the greatest Japanese modern poets. Tanizaki and Sato jointly proclaimed her decision, which became well known as a case of wife transfer. Mr. Yosimoto Ryume, who is a famous poet, a critic and father of the female novelist Yosimoto Banana, had a narrow escape from sea on August 3 1996. He was swimming at Toi beach in Sizuoka prefecture and drowned to lost consciousness. He is 71 years old but fortunately did recover senses in the next morning. The director Ohasi Yasu presented Sakura sakura no Gentaiken (The fake cherry blossoms as a starting point) in the first week of August at Theatre X in Ryogoku, Tokyo. Ohasi was a student of Abe at the faculty of theatre in the Toho-gakuen college and she worked as an assistant director with him at Abe Kobo Studio (1973 - 1979), in which he made a lot of experiments on actor's methods and developed original exercises called Abe System. Sakura sakura no gentaiken is an omnibus drama consisted of exciting scenes from Abe's five great novels, including The Woman in the Dunes, The ruined Map, The Face of Another, The Boxman and The Ark Sakura. Some scenes, especially parts of The Woman in the Dunes and The Face of Another were excellent, but others not. Ohasi fairly succeeded in summing up the fifty years of Japan after World War II. Kodansya published the 50th anniversary issue of Gunzo, a monthly literary magazine, which started in October 1946. Before World War II, Kodansya was a popular publisher and committed in ultra-nationalism. After the defeat of Japan, Kodansya turned to democratic and general publisher. Starting Gunzo was a symbol of its new policy. Gunzo holds the Sosaku Gappyo, discussion meeting on 2 or 3 works appearing in this month since the first issue. Reading them serially, you can survey history of Japanese literature after World War II. Gunzo has literary awards for new writers and new critics. Winners are Murakami Haruki, Murakami Ryu, Karatani Kozin, Oba Minako, Ri Kaise, Akiyama Syun, Nakazawa Ke, Takahasi Gen'itiro, Ii Naoyuki, Muroi Mituhiro, Syono Yoriko, Yosimeki Hruhiko and so on. Kodansya holds an exhibition titled Bungaku no Sengosi (History of Japanese Literature after World War II) at the gallery of the head office of Maruzen from September 8 to 17, and at its Kyoto branch from October 2 to 8. You can see hand-writing manuscripts of masterpieces appeared on Gunzo. 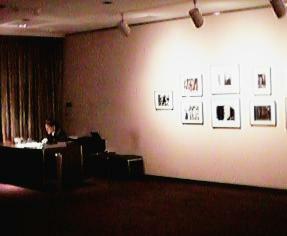 In every evening, a writer reads aloud his short story at the gallery. On the first night, Murakami Ryu appeared. After reading , he said, "When I got the Gunzo's award for new writers, I did not read literary magazines like Gunzo and thought that young men did not need to read such magazines. Today, however, it seems natural to me that young men doubt Japanese reality to read Gunzo, because no Japanese enjoys everyday life and some people are absorbed in Aum Cult, although Japan becomes the richest country." The Gunzo magazine inquired of 51 critics what are the best 3 works of Japanese literature in this 50 years after World War II. It declared the poll on its 50th anniversary issue. We presents the best 5 of authors and of titles. Miyazawa Kenzi, poet and juvenile story writer, was born on August 23 1896 at Hanamaki-Kawaguti town (today, a part of Hanamaki city), Iwate prefecture and died on September 23 1933 at 37 years old with tuberculosis. He lived in Tohoku district throughout his lifetime so that literary world in Tokyo did not know him. He published only two books before he died namelessly. Today he is the most popular poet in modern Japan and all of his enormous posthumous works are strictly revised and published in 20 volumes from Tikuma Syobo Co. In this summer, many bookstores set up special counters for his books and a lot of tourists visited at Iwate prefecture, which Miyazawa called Ihatove (fairy land) in his fantastic stories. The city government of Hanamaki made memorial events in last July and August, featuring the international symposium in Tokyo and the theatrical festival at Hanamaki. And two major film companies of Japan, Syotiku and Toe, release films on Miyazawa Kenzi; Miyazawa Kenzi --Sono Ai (Miyazawa Kenzi --his Love) and Waga Kokoro no Ginga Tetudo (My Memorial Galactic Railroad) in this autumn. Taisedo Bookshop presents top 3 of best-selling titles of Miyazawa Kenzi. Ono Tozaburo, poet, died on October 8 1996 at age of 93. He was born in Osaka in 1903. When he was 20 years old, he went to Tokyo to take part in anarchism movements and he published his first poetical work, Hanbun Hiraita Mado (A half-opened Window, 1926). In 1933, he abandoned deracine life in Tokyo to return to his home town, Osaka, so that he advocated Tedyusya no Bungaku (Literature for permanent residents in his home town). He made many literary circles in Osaka and founded Osaka Bungaku Gakko (Osaka Literary School) in 1954. He brought up many pupils, including Tanabe Seko and Tomioka Taeko. The widow of Ooka Syohe donated manuscripts, documents and collection of books to Kanagawa Kindai Bungakukan (Kanagawa Literary Museum) in Yokohama. Manuscripts and documents amount to about 1100; books to about 5200. Kanagawa Kindai Bungakukan makes the special exhibition on Ooka Syohe since October 19 to November 24 1996. 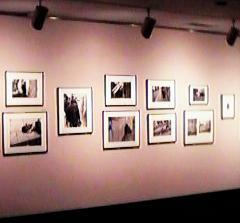 The month-long exhibition of Abe Kobo's photographs is held in Weldenstein Tokyo, a gallery at Hibiya since October 26 to November 29 1996. Admission free. Closed on Sundays and national holidays. Ms. Huku Noriko selected and compiled his photographies, which were also exhibited at the Commemoration for Abe Kobo at Columbia University in last April. The gallery is at the back of Tegeki (Imperial Theatre) upon the moat of Edo Castle. 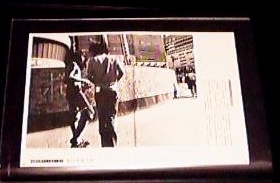 The solid catalogue, titled Kobo ABE as photographer, for 2,000 yen (about $20). It is available with mail order (postage for 370 yen in Japan). NHK Educational TV airs its introduction in Nitiyo Bijutukan (Sunday Museum) on November 10. Professor Sugitani Tosiro and his student, Ms. Kano Sinobu found out two unknown Waka poems of Saigyo(1118-90) in the old album titled Mosiogusa, which was taken over from the lord of Nagaoka domain to a wealthy family, the Hosinas in Kawanisi town, Naka-Uonuma country, Nigata prefecture. Sakari sigururu Katuragi no mine. Keburi wo taturu Hirokawa no sato. On November 25, Professor Sakurai Takeziro and Professor Ueno Yozo presented that they discovered the original manuscript of Oku no Hosomiti after over 250 years. They decided it through handwriting analysis and most of scholars supprot them. Oku no Hosomiti (Narrow road to Oku) is the poetical account of a journey by Matuo Basyo(1644-94), the Haikai Master in early Edo period. Basyo went on a long journey around north and central regions of Japan from 1689 to 1690 with his pupil, Sora. Based on it, he wrote Oku no Hosomiti. 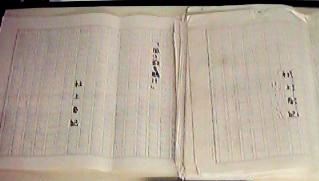 The original manuscript in Basyo's own handwriting is called Yababon, which had been offered in the 50th anniversary of death of Basyo and was missing. There are two other manuscripts, Sorabon and Nisimurabon. Sorabon was copied by Sora but it contains many errors. Nisimurabon is also called Soryubon, because Basyo made Soryu, a calligrapher, copy his original manuscript, Yababon. Basyo presented his elder brother with this replica, Nisimurabon. It was later published with woodblock print and was believed more accurate than Sorabon. It is turned out that Basyo revised it on 74 passages and that the standard text contains 8 errors. Nakao Syosendo published its deluxe reproductions in November 1996 and Iwanami Syoten will publish them in cheap edition in the next year. 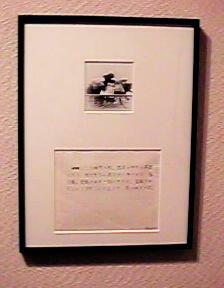 The original manuscript is owned by Mr. Nakao Ken'itiro in Osaka City. In 1956 and in 1981, he asked scholars to judge the manuscript but they judged it as a copy because it looks too new. However Iwanami Syoten published The complete original manuscripts of Matuo Basyo in 1993, handwriting analysis for Basyo is promptly developed, so that it is judged as original. Mr. Nakao deposits it with the Osaka City Museum. Means of acquisition are unknown, but Urai Arikuni(1780-1858), a Haikai poet and collector, owned it at one time, because his name was written on the wrapping paper. This page was created on May 1 1996; Last updated Oct12 1997.